Found this in B&Q Beckton and have to say it's a pretty decent piece of kit for the price. Comes with a soap foam nozzle which is great for car washing. In my experience Bosch should have and should leave the power washer market well alone as there's are almost always crap! Without going into detail - I've had 2 models and now I have a nilfisk or whatever it's called and the latter is by far a power washer worthy of its name. I have always found Nilfisk to be superior but was surprised that Which? gave a Bosch top rating! e.g. Though I've often found Which? reviews a little dubious especially if you read actual users observations on their site. thanks I was almost considering to buy it. I still voted hot for the effort. Nilfisk all the way, used my p150 for the first time on old pathway slabs and a walled fishpond last night, fantastic result, slabs look new. 150 psi blast offs. Made me happy and even my wife was nearly as happy. Got the Bosch 37 model a while back with great performance and no problems. They come with a 2 year Bosch warranty anyway. 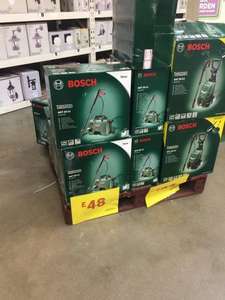 B &Q also have the 35 and 37 model at cracking prices and they come with the patio cleaner, if you can find one. My Bosch jet wash didn't last that long before having to go back to Bosch to have the pump replaced. The axle that holds one of the wheels on, broke as well. Recently replaced it with a Nilfisk which has been brilliant so far.